The city of West Hollywood offers community members two ways to make a difference in the lives of disadvantaged individuals in observance of MLK Day. The Cityline Commuter will operate extended hours on Jan. 19 to assist community members in traveling to and from the Metro Red Line subway, which stops at Pershing Square and provides access to the Women’s March. The Women’s March is scheduled from 8:30 a.m. to 2 p.m. on Jan. 19. The free Cityline Commuter Special Service will run between the West Hollywood Library and Hollywood & Highland, for Metro Red Line transportation to the Women’s March. The service will also stop at other locations along its regular route on Santa Monica Boulevard. Cityline will run at 15-minute intervals starting at 7:15 a.m. at the West Hollywood Library, located at 625 N. San Vicente Blvd. The last shuttle leaves at approximately 8:45 a.m. Parking is available at the five-story parking structure adjacent to the library. Returns from Hollywood & Highland will depart at 1:30, 2:15, 3:30 and 4:15 p.m. The timetable will be posted at weho.org/cityline. 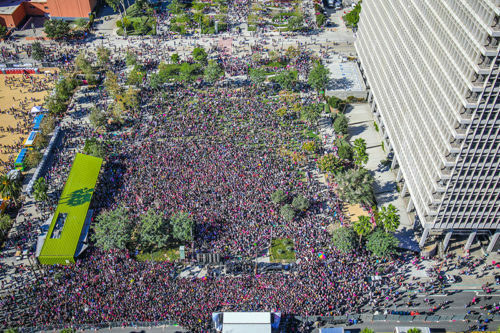 For information about the Women’s March, visit womensmarchla.org. On Saturday, Jan. 19, from 7 a.m. to 9 a.m., the city will collect donations of new and used clothing and accessories for the Los Angeles LGBT Center’s Youth Center on Highland Avenue. The collection will be held in the West Hollywood City Council Chambers, 625 N. San Vicente Blvd. The Los Angeles LGBT Center’s Youth Center on Highland is in need of new and lightly used pants, shirts, suits, belts, shoes (men’s sizes 7-13, women’s sizes 6-12, with the shoes tied together), jeans, jackets, coats, ponchos, sweats and T-shirts. The center is also requesting new packages of socks and underwear, as well as travel-sized hygiene items such as toothpaste, toothbrushes, shampoo, soap and shaving items. Gift cards for Target and grocery stores are also appreciated. For information, visit lalgbtcenter.org.